VoteLynx touch panels provide simple, easy to use controls to manage meeting functions. From the touch panel, users can view and manage request-to-speak, agenda item, motions and voting progress in the VoteLynx XLG system. Other VoteLynx functions are also available including vote control and speaker timer display and control. 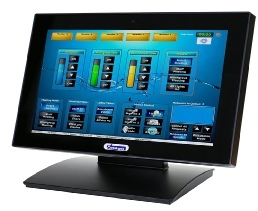 Any combination of VoteLynx control and management functions may be enabled on the RST-120 touch panel. Request-to-Speak functions include selecting discussion or request modes, selecting a member to speak from the list, speaker time tracking, canceling speaker requests and controlling individual member microphones. In addition to voting and request to speak functionality, any desired audio-visual controls may also be added to the screen. For example, these could include control of audio volume, video selection, projector or lighting system or PTZ robotic cameras. Panel controls, visual appearance and operation are completely configurable from simple point and click menus to enable quick changes to the system. This allows the system to be tailored to each administration’s needs. Several touch panels are available for managing request to speak, timer audio visual control and other functions. Touch panels display agenda, motion and voting information. Graphical layout and control functions are user configurable.